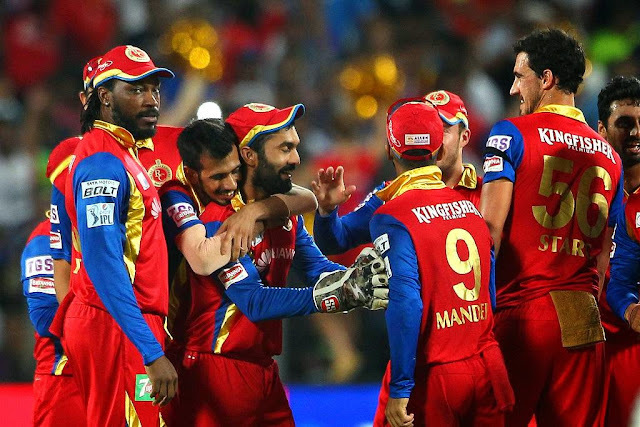 Royal Challengers Banglore strangle Rajasthan Royals and advance to Qualifier 2, in a game where the Red Army comprehensively crushed RR by 71 runs and AB de Villiers(66) and Mandeep Singh(54*) helped RCB make a smart recovery that guided them to victory. RCB Skipper Virat Kohli won the toss and elected to bat first and set up a challenging total for Rajasthan Royals. Royal Challengers Banglore started off leisurely, not capitalizing on the power-play. Gayle(27) and Virat(12) didn't seem very comfortable and this opening duo departed in the infancy of the game without causing much damage. As RCB's dangerous dyad departed without tormenting the opposition, the Red Army seemed to be in tribulation, Banglore's Super Hero arrived and turned the table for them once again. This man has proved his calibre time and again and there is no one in any format that can match him. AB de Villiers(66) rescued the sinking RCB ship and not only brought it back onto the shore but also gave them an upper hand in this do-or-die game. Mandeep Singh(54*) proved his mettle and showcased what young Indian talent can do. Mandeep and de Villiers together took the bowlers to the cleaners and bashed the RR attack. de Villers cruised to a half-century but was run out by Stuart Binny soon. Mandeep Singh then picked up the loose threads and stitched a perfect end for the Banglore Boys. After having a disastrous start, Mandeep and ABD were the Superstars that helped RCB cross the finish line,RCB finished at 180/4. Rajasthan Royals were unable to get some big partnerships that could have helped them advance to the Qualifier 2, Opener Ajinkya Rahane(42) was the light at the end of the tunnel for RR but he was trapped by Chahal and failed to guide his team to victory. Watson(10) who thundered upon the Knights in their previous match wasn't able to weave magic today. Wickets fell like skittles for the Rajasthan Royals and it was too late for anyone to save them. Youngsters like Hooda(12) and Karun(11) who had earlier worked wonders for their side crumbled under pressure. The RCB attack gave nightmare's to RR repeatedly and the IPL-1 Champions were sent back to the pavilion for 109. It was disappointing too see Rajasthan unable to make the most of the situation. A humiliating defeat meant that RR would now bid IPL-105 good bye. That leaves CSK, RCB and MI to clash for the crown,Mumbai Indians will take on the winner of Qualifier 2 which will be played between CSK and RCB on Friday in Ranchi. The Man of the Match Award along with the maximum sixes award was gifted to AB de Villiers and Mandeep Singh bagged the hot star award. Bangalore defeat Rajasthan, will face Chennai for a spot in the IPL final.